For his centennial, an indispensable biography of Artie Shaw, the legendary big-band leader, virtuoso clarinetist, and renegade in music and romance. A brilliant, wide-ranging book on how the seminal album revolutionized music and culture in the twentieth century. The #1 text in the market—now in an Essentials Edition. 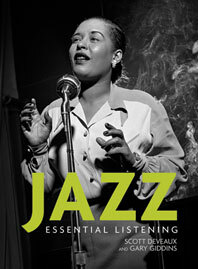 Jazz: Essential Listening provides all the materials students need to listen to, understand, and love jazz. Written by two master storytellers, this new brief text combines a dynamic listening experience with vivid narrative history, must-hear masterworks, and a superior eMedia package to reveal the excitement of America’s quintessential music. Authors Scott DeVeaux and Gary Giddins write with intellectual bite, eloquence, and the passion of unabashed fans. They explain what jazz is, where it came from, how it works, and who created it, all within the broader context of American life and culture. Covering a little over half the repertoire featured in Jazz, the Essentials Edition focuses on the most important figures and their major works. Streamlined in-text Listening Guides focus on key musical details, and recordings are available in two convenient formats. Interactive Listening Guides combine audio with author commentary for guided listening. Jazz: Essential Listening teaches students how to recognize the sounds of jazz—how it is made, its characteristic features, and the most common forms. Understanding these basic elements helps students grasp how jazz musicians work together to create timeless performances. Jazz: Essential Listening shows how the basic features of jazz are derived from African or African American musical practice—cyclic form, blues, call and response, polyrhythms, and timbre variation. Every chapter describes the experiences of the musicians who created these masterworks in stunning images and gripping story, allowing many of them to speak for themselves. Two passionate authors—a respected scholar and a leading critic—tell the story of jazz from a first-hand perspective, combining 80 years of shared experience as listeners, performers, critics, and ardent fans. Noted jazz photographer Herman Leonard shares exceptional photographs throughout, along with the work of other top jazz photographers, to present an arresting visual history. Jazz: Essential Listening integrates clear, engaging text with an exceptional electronic media package, providing students the resources to excel in class, and instructors the tools they require to offer a dynamic introduction to jazz both on and offline.